Oh hiiiiiii. Happy Monday. How was your weekend? Did you relax? Go out on the town? Soak up every last bit of sun as you could? Whatever the case, I hope you’re heading to this week feeling like a warrior. By the way, if you haven’t noticed, we’ve started putting inspirational quotes on our Instagram each Monday to make the start to your week a little bit brighter. It’s amazing what a little positivity can add to your day. 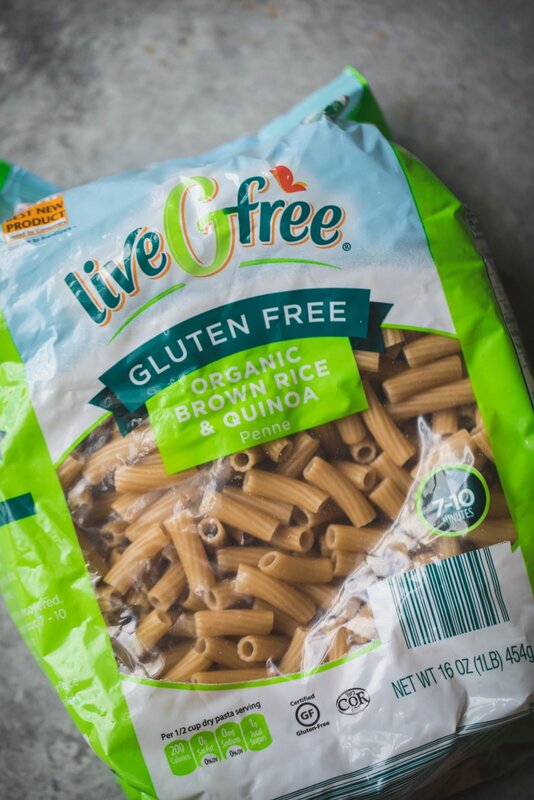 Today I’m thrilled to be partnering up with ALDI to share this gorgeous vegan and gluten free pasta with their delicious liveGfree gluten free brown rice & quinoa penne pasta. If you haven’t shopped at ALDI, I hope this post convinces you. It’s affordable, they carry a variety of organic and gluten free exclusive products and SOME REAL GOOD CHIPS (just sayin’). 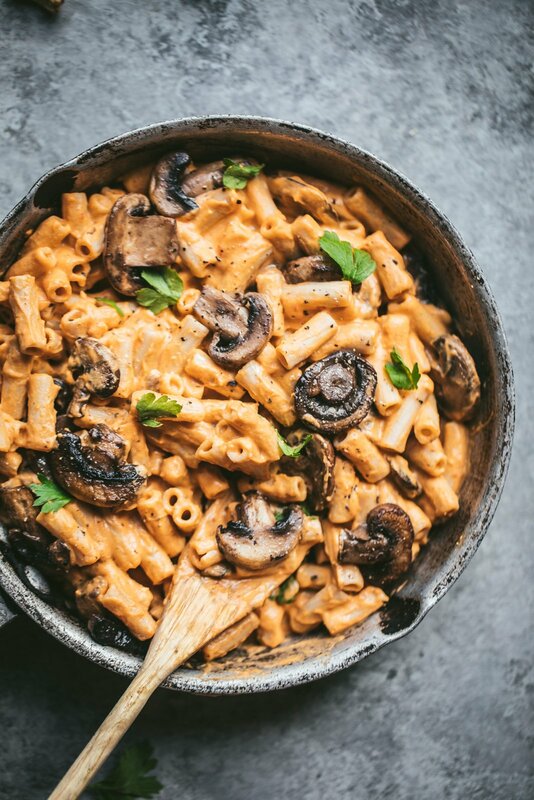 The pasta is wrapped around a creamy sweet and spicy sweet potato sauce made with cashews, roasted sweet potato (or you could sub pumpkin or butternut squash), chipotle chile peppers and garlic. Then if you’d like you can add sautéed mushrooms for a unique umami flavor. What I love about the ALDI-exclusive liveGfree gluten-free line is that it’s now backed by the Good Housekeeping Seal. This means that each liveGfree product was evaluated and quality tested by the food & nutrition experts at the Good Housekeeping Institute, so you know you can trust it. 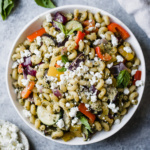 If you want to make this pasta your own, feel free to add extra sautéed veggies; we think red bell pepper, peas or asparagus. And if you aren’t vegan, I highly suggest adding some bacon crumbles on top and a little parmesan. SO GOOD. Finally, I’d love to hear from you if you’ve ever shopped at ALDI and what some of your favorite finds are. To find a store near you, click here. I personally love their mixed nuts, trail mixes, nut butters, organic produce, seedy bread, organic coffee, flax seed, chia seed, virgin coconut oil, raw honey, pure maple syrup… and their Clancy’s big dippers are secretly the best tortilla chips ever!! TRUST YO GIRL. I hope you love this recipe as much as we do! Let us know if you try it. Xo! 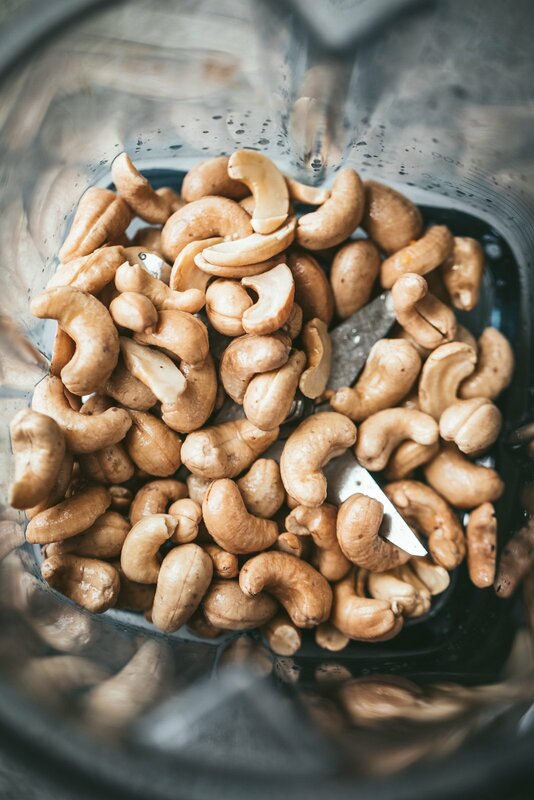 Make sure you soak the cashews in 4 cups of water for at least 2 hours, otherwise you can place them large bowl, then add 4 cups boiling water and let the cashews soak in the hot water for approximately 45 minutes to speed up the process. Once ready to make the pasta sauce: add drained cashews, roasted sweet potato, water, garlic, chipotle chile pepper, nutmeg, salt and pepper to a high powered blender. 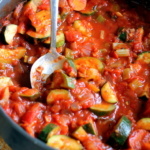 Blend until a thick sauce comes together, adding a tablespoon or two more of water, if necessary to help blend. Taste and adjust seasonings as necessary. Set aside for later. Boil the pasta according to the directions on the package. Drain pasta, then transfer back to pot. While the pasta is boiling, sauté your mushrooms: add olive oil to a skillet and place over medium heat. Add mushrooms and then season with garlic powder, salt and pepper; sauté for 3-5 minutes until mushrooms are cooked and look nice and juicy. Stir sweet potato sauce into the cooked pasta. Add mushrooms and stir again. Garnish with sage or parsley, whatever you prefer. Serves 4. *To roast your sweet potato: Preheat oven to 375 degrees and line a baking sheet with foil. 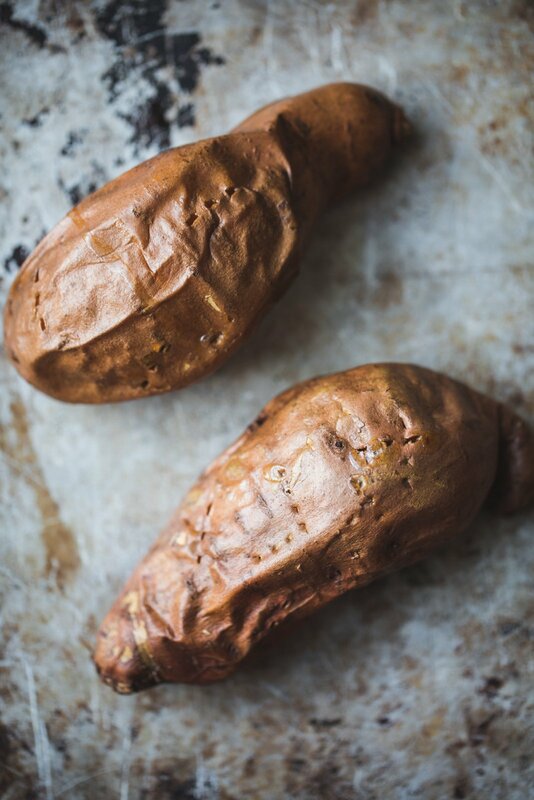 Use a fork to poke holes in sweet potato and then place on foil. Roast in oven for 45 minutes or until a fork easily pierces through the potato. 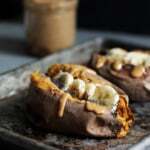 Feel free to use canned pumpkin puree or butternut squash puree instead of sweet potato. You'll need about 3/4 cup puree. This recipe is sponsored by ALDI. All opinions and text are my own. Thanks for supporting Ambitious Kitchen and the brands that help make this site possible. 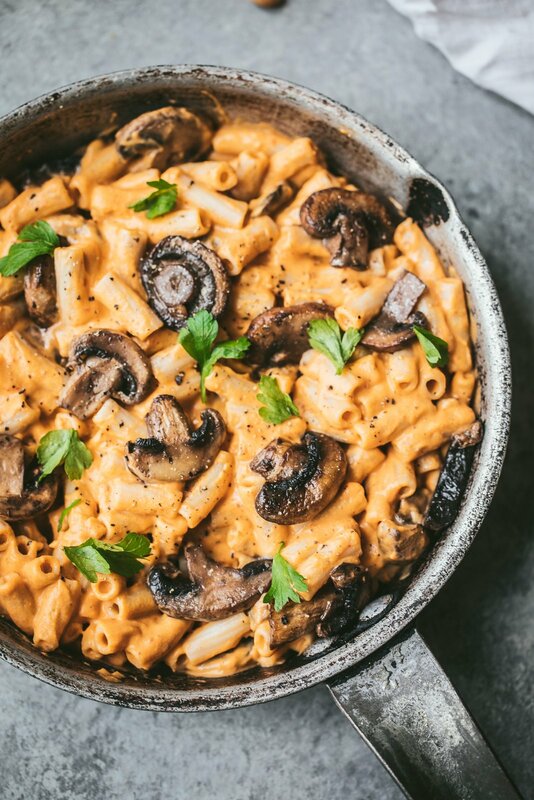 36 Responses to "Creamy Chipotle Sweet Potato Penne Pasta"
YES to bacon on top! This looks great, I will def make this soon! I shop at Aldi regularly for most of my grocery needs (Whole Foods to supplement what I can’t find there). I’m happy to see that you are working with them and shed some good light on the organic brands that they now offer at very reasonable prices!! Ooo I’ll have to try those next time I go! Can something be used in place of cashews? You can actually leave the cashews out and use a couple tablespoons of olive oil! 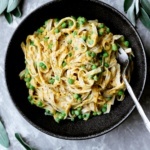 Made this today with green pea and quinoa pasta. So good! I added. Little park at the end though! I have tried sweet potato as a sauce before and it’s fantastic! Cheese sauce though…that is a recipe I have yet to recreate at home, but I’m always down to do so! Hi! Any way you have the nutritional information for the sauce/mushrooms? Basically everything but the pasta…because I’ll be using a different pasta. Thanks! Hi Morgan! I calculated this recipe all together, so I don’t have the separated info. You could do a quick search of this pasta vs. the one you’re using in order to adjust! Made double amount for lunch today, its delicious! I fried the mushrooms with onions and also added asparagus, shredded cheese and bacon on top. 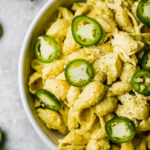 This will definitely become one of our go-to recipes, so easy, healthy and tasty! My husband and daughter liked it too.